Ankle boots are the unsung hero of fall, giving you the style versatility to match your every whim. 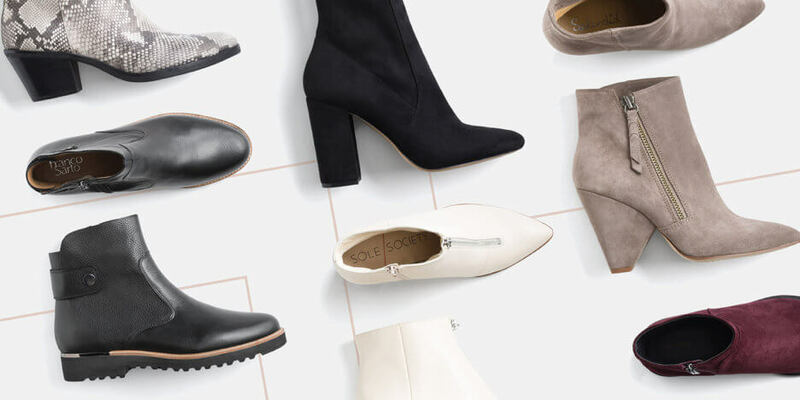 From exploring the great outdoors to dashing off to work, we’ve got the right ankle booties to help you pull your look together. Keep reading to get ideas on how to style your ankle booties this fall! 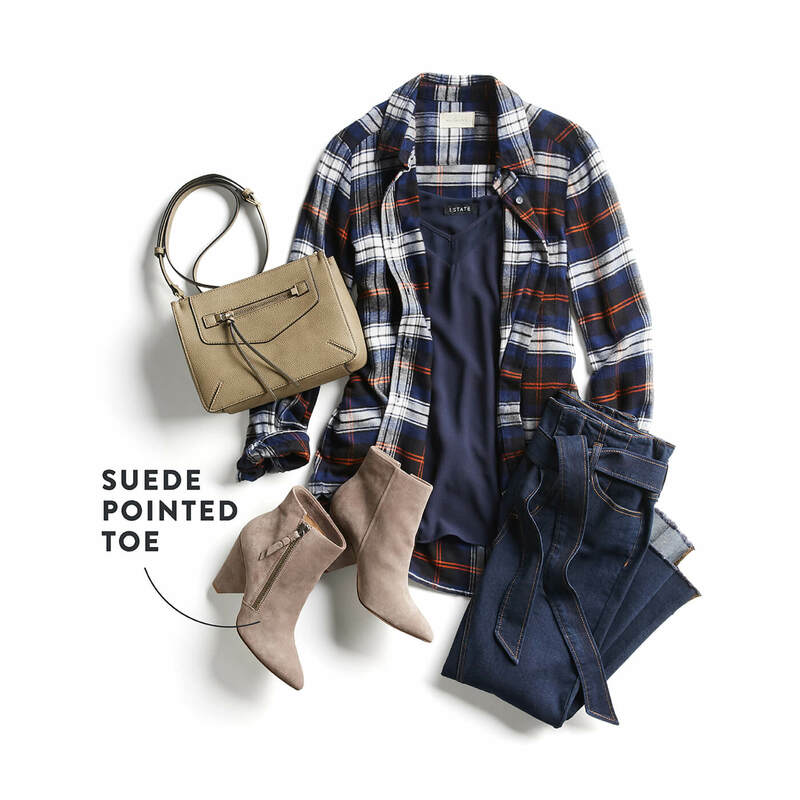 Ankle boots, jeans and plaid are a match made in style heaven. This quintessential fall combo is transformed into trucker-chic for the modern urbanite. A sleek, neutral suede pointed toe bootie will go with everything from flirty dresses to jeans and is always in style. Stressed about dressing comfortably for work? Never fear, the flat ankle boot is here to rescue you! A dark suede rounded toe bootie adds a subtle richness and comfort to this easy Monday-Friday look. Pile on the layers with your favorite cozy sweater, crisp white button down and stretchy plaid pencil skirt. Stylist Tip: Booties pair well with both A-line and pencil skirts with dark opaque tights, or jeans and thick ankle socks. Go bold or go home! Trendy white stacked heel booties after Labor Day are for the dauntless fashionista who plays by her own rules. These showstoppers will give any outfit a surprise pop, especially when paired with bright accessories and sporty athleisure threads. Cooler temps call for warmer outfits. 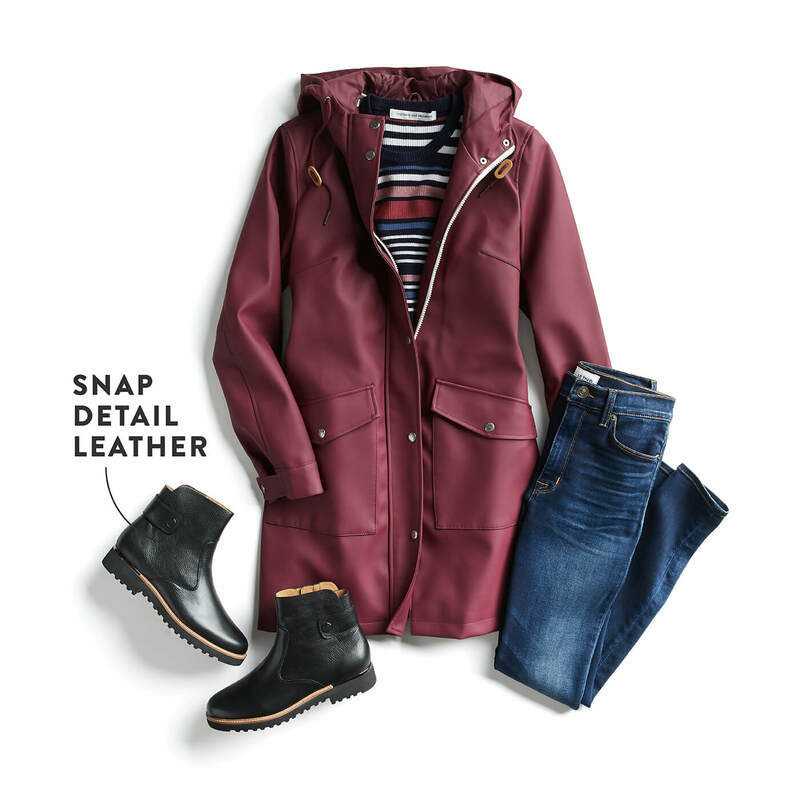 Whether you’re headed to the pumpkin patch or taking a hayride with the kiddos, a sturdy flat leather lug-soled bootie and rich-toned fall parka is your obvious outdoor, all-weather uniform. Got errands to run? This look is playful yet functional—and comfy enough to take you all over town for fall wreath shopping or brunch with the bestie. Dark blue contrasted with burnt orange is a fresh take on classic denim layers. 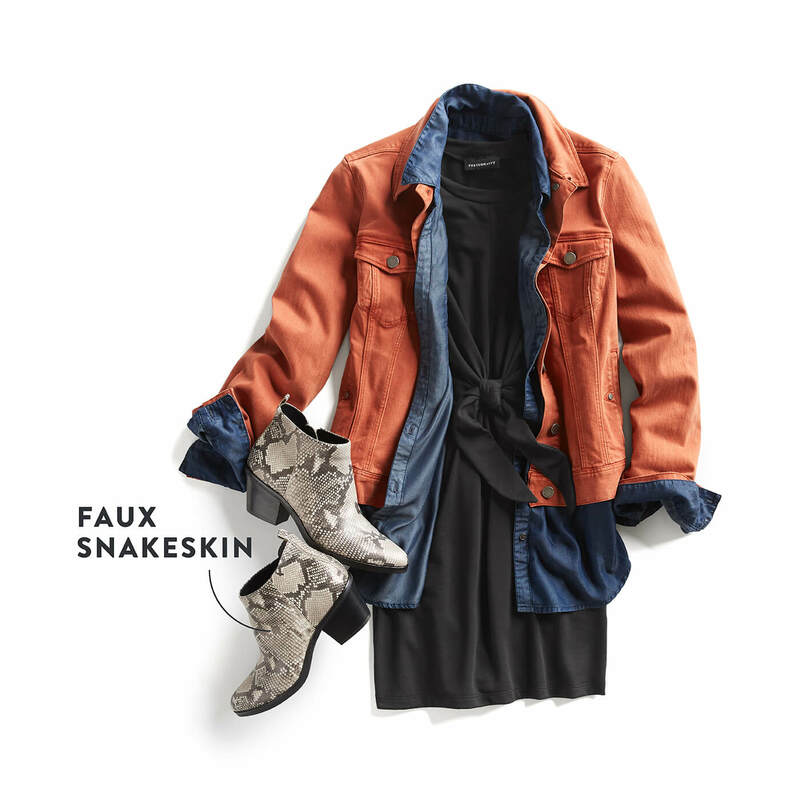 A fun python bootie and stretch knit dress with knotted waistband creates a flattering waist, cinching the look. This neutral, yet sleek look has a modern twist that shimmies the line between business casual and happy hour. A stacked-heel black bootie with jeans is the perfect foundation to mix and match your patterns the right way. Tweed, stripes and a leopard clutch adds visual interest to this urban achromatic look. Ready to try the fall ankle boot trend? Be sure to request a pair in your next Fix. Hi, I’m Alexandra. Ankle boots are a fall essential. They’re chic, they’re comfortable, plus they go with everything, so what’s not to love? Today I’m going to talk to you about four different ways to style your ankle boots this season. Flowy dresses and ankle boots are a match made in style heaven. Pair [00:00:30] a printed dress, like this gorgeous fall floral, with a block-heeled ankle bootie, and bonus points if the heel is embellished like this one. Top off the look with your favorite jewelry and a gorgeous crossbody bag. If you’re always on the run, this is the easiest way to wear your ankle boots this season. 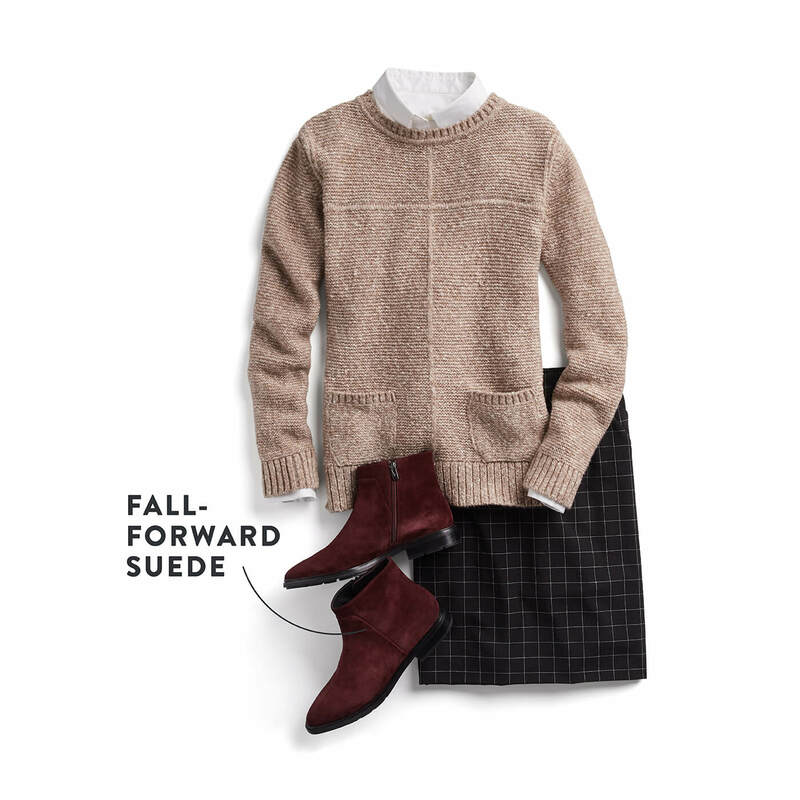 Wear your tried-and-true skinnies with a fall-toned [00:01:00] cozy sweater and throw on a pair of contrasting-color ankle boots. Thank you. No matter if you live in a busy city or in the suburbs, you never know who you’re going to run into. It could be your boss. It could be your ex. It could be your boss’s ex. Keep looking sharp and tailored with a pair of dark-washed skinnies, [00:01:30] a crisp, tailored blouse, and a block-heeled ankle bootie really keep you on the go. Keep things minimal with a bootcut jean and a pointy-toe, high-heeled boot. This really elongates the leg and creates a super-slim silhouette. If you’re not into high-heeled boots, try a low-heeled Chelsea [00:02:00] boot. Swap your bootcuts out for skinnies to keep the look the same. Thank you so much for tuning in. Be sure to check out Stitch Fix Style for even more styling advice.